Following our look at a $9,681 Amish buggy, we’ve got an excerpt from Richard Stevick’s Growing Up Amish: The Rumspringa Years which explores the topic of Amish youth and their horsepowered vehicles. In this selection taken from Chapter Seven (“Singings: The First Step to Independence”), we learn about the many ways the Youngie adorn their buggies (including one surprising modification I had never heard of before, see if you can guess which), as well as which horses are preferred for looking good on the road. In most places, Amish tradition links a boy’s ownership of his own horse and carriage to his involvement with his peers at the singing. In acknowledging their son’s new rumspringa status, parents in most places customarily give each boy his own carriage and horse at the age of sixteen so that he can drive himself, and often his sisters, to the weekly or bi-weekly singings. In many communities, a young man’s carriage is easily discernible from the family carriage. For example, in certain conservative Lancaster County gangs, unmarried youth still drive open buggies year-round. Until the 1970s, all young couples traveled in these “courting buggies,” completely exposed to the elements and to the eyes of the curious. A father who was a teenager at that time conjectured that the move to the closed carriages began when some non-Amish youth began hassling courting couples by jumping in the back of the buggies as they passed. “Also it was ridiculous riding around in an open buggy in the freezing winter,” he added. When church districts began to permit closed carriages for the youth, some elders worried about a possible surge in sexual immorality. Others complained that it would be easier to hide radios or other forbidden things. Nevertheless, most adults soon accepted the change when they failed to detect any discernible moral decline. Amish teenagers do not alter the basic contours and configurations of the approved community carriages. For example, they do not custom paint them, change the color, or embellish the wheels with chrome spokes. However, a young person’s carriage often has its own accouterments that a knowledgeable outsider can quickly identify. In many places, the young owners “customize” them by adding auxiliary features to conform to the latest fads of their peers. In Lancaster County, young men’s carriages may sport two dozen or more red reflectors around the rear perimeter as compared to the three or four reflectors on the family carriage. In addition, the more daring youth now attach to the rear of their carriages a strip of blinking LED lights, which serve to attract the attention of passing motorists and the young drivers’ peers. Frequently, boys dress up their slow-moving-vehicle triangle with a decal from the National Rifle Association or the NASCAR racing logo, and one carriage sported a Great Adventures Amusement Park bumper sticker. An article in the Lancaster Sunday News on carriage accouterments reported that boys’ carriages sported a variety of decals and bumper sticker messages, including “Single and Ready to Mingle” and “Get High on Milk: Our Cows are on Grass.” Another visual clue to young men’s transportation in Lancaster County is that many youth employ white or blue harness guides and keepers rather than the traditional black accessories that characterize adult carriages. In Central Pennsylvania’s Big Valley, the misnamed Nebraska youth drive simple white-topped, open-front buggies that are basically identical to their parents’ carriages, inside and out. They are constructed at home or a neighbor’s shop for half the cost of buggies belonging to boys in the nearby Renno or Byler affiliations. The Nebraska design is a simple brown wooden riding box with friction foot brakes and two hard benches. It also features a kerosene lantern and a blanket for the benches to protect the passengers from blowing horse hair, dirt, or cold air. Meanwhile, youth from the Valley’s most progressive Byler Amish purchase yellow-topped carriages that externally mirror their parents’ carriages but can depart significantly from adults’ interiors. Marvin, a personable nineteen-year-old Byler youth, expressed obvious pride as he showed me the inside of his newly purchased carriage, an incongruous juxtaposition of plain and fancy. “I went down to Lancaster County to buy this one because their carriages are a lot nicer than the ones sold here in the Big Valley. One thing, their buggies have nicer switch boxes made out of oak with this glossy finish and they have this ignition switch so that nobody can mess with my battery-operated lights,” Marvin explained. “They also put these nice burnt edges on the trim with acetylene torches,” he pointed out. The switch box also featured a toggle for his running lights (flashing lights used at night for safety) and another switch to control the two interior floor lights. Finally he showed us the cigarette lighter, “for my spotlight,” he quickly added. One observer described this kind of interior decor as “neo-Vegas” (Goldstein 1997, 40). Everything in Marvin’s carriage was color-coordinated in maroon, from the swirled, velvet-covered walls, ceilings, and carpets to the wine-dyed sheepskin on the front seat and the rabbit foot hanging from one of the switches. Even the two theater-style inside lights glowed red. Artificial roses and apple blossoms decorated each corner, and a wreath of roses encircled the overhead dome light. A pair of fluffy dice, a car air-freshener, and a mini-flashlight inscribed with the name of the carriage shop dangled from the switch box. On the box itself, a decidedly non-Amish decal of a bald eagle clutched an American flag in its talons. Two more eagles graced both ends of a glossy shelf where he kept his Liedersammlung, the thin songbook used at their Sunday night singings. “Indian feathers” hung from a tack in the ceiling, and more feathers intertwined with the roses in the wreath. A small stuffed teddy bear completed the soft decor. In the glove box he stashed a bottle of musk cologne, and the polished dash featured a clock and a battery gauge. A second air-freshener dangled in the rear. Under the back seat he stored his horse blanket. Only a few conservative communities will permit their youth to individualize their carriages. In Mercer County, Pennsylvania, a historically plain settlement, young people call their carriages “cozy-cabs,” and the owners lovingly “fancy them up” with plush carpets and velvet. Nevertheless, most do not sport heaters, clocks, and speedometers, nor do they hide stereo speakers or battery-operated DVD players behind a curtain in the back as do some of their large settlement counterparts. Even young men from the more sedate New Order Amish occasionally succumb to carriage fads. Some years ago, according to one teenage girl, the then-current style was to sport a cracked windshield. To the consternation of their parents, her brothers and some of their peers reputedly cracked the glass in their own windshields to make the appropriate fashion statement. A spirited and well-proportioned horse adds status to its owner as he seeks to impress his peers, both male and female. In Lancaster County, boys usually prefer saddlebreds, but some like standardbreds best. Marvin, from the Byler group in the Big Valley of Pennsylvania, chose a saddlebred horse to go with his yellow carriage. “Saddlebreds look good when you drive them,” he explained. “They hold their heads up high and are also high steppers. They may not be as fast as standardbreds, but they are stronger in the long haul. The Nebraska boys’ horses look so tired because the church won’t let them use the rein that holds their head up. And some of their horses aren’t very well cared for,” he added. He continued, “Sometimes our boys will race our horses after the singing. One horse will break out of line and try to pass the horses in front. One time I went over the crest of a hill at night because my horse couldn’t get past the others. But these back roads are pretty quiet around 11:00 when we race. Another time I let my horse run like that, and he passed about fourteen carriages when I couldn’t hold him back. Horses like to run once they get into it. But it’s hard on the horses. I sprained one of our horses’ legs six months ago, and it’s still bad. You learn not to do that,” he grinned. If you enjoyed this excerpt, odds are you’ll like the rest of the book. 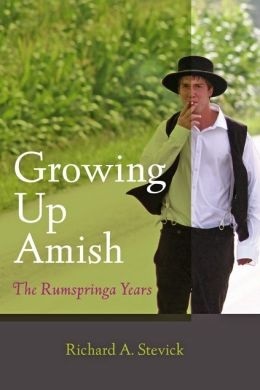 You can find Growing Up Amish: The Rumspringa Years at various places including Amazon and Barnes & Noble. Interesting article; I’d like to read the book. Was the cracked windshield the modification you hadn’t heard of? Fascinating stuff. Goes to show that young people develop their own forms of rebellion against the older generation no matter what culture they grow up in. My mom grew up Amish, and she told me one time that before or after church or at other gatherings when the boys and girls were scoping each other out the girls would hike up their skirts to show more leg when the adults weren’t watching. There’s nothing new under the sun! I’ll have to read that book, too. But this reminded me that a couple of Sundays ago I rode past a home church service in northern Branch County, Michigan. Usually Amish people drive their best to church, but the open top buggies I saw this time were all so highly polished and detailed, with tight-fitting covers – it made the same impression on me that finding a parking lot full of Ferrari and Jaguar convertibles would at my home church. If there were any customizations underneath the covers, I don’t know. I’d love to have gotten close-up photos of the buggies, but I think I had already become a distraction to the worshipers singing inside, so I just admired them as I rode past. Go no more than 15 miles south, and I think the Amish there are too conservative for something like this. On the other hand, I had never before seen Amish buggies like this in the north part of Branch County, either. I might be wrong about this, but I’ve noticed the Amish of Allen Co., Ind. background have exceptionally nice buggies while the ones of Adams Co., Ind. background are plainer and not as well kept. Both are Swiss Amish, but there really is a difference. I’ve spent some time on the roads in the south part of Adams County, and I’d agree with your observation about those people. I’m not so familiar with the Amish of Allen County, other than what I’ve read on this blog. Do you know if both groups are part of the same migration from Europe? I understand the Amish of Adams County to have migrated later than most U.S. Amish. According to the community listing from last Oct. (in Family Life magazine) Adams Co. was settled by Amish in 1850 and Allen Co. in 1852, so yes they came later than other Amish. I read the original book this summer…I THINK the only part I noticed being different here was the blinking LED light strip on the buggy. The cracked windshield was mentioned in the old version, as well, but I was surprised by it when I read it, too! I’ve seen so many fads come and go that I always find it humorous to see “youngie” (Amish or English) doing/using/wearing something that was a fad back in my day, too! Everything old is new again, or, been there, done that! I either missed or simply forgot that bit, has been a few years since I read edition 1. Sounds like a tough guy look. I can see the parents shaking their heads but I guess there are worse ways to be wild. If it looks like the world, tastes like the world, smells like the world, sounds like the world…. Naomi, there are a lot of Amish who would agree with you on that. I don’t know of any Amish group that has such deluxe carriages as the Lancaster & related groups.